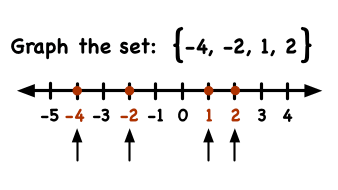 How Do You Graph a Set on a Number Line? How Do You Name a Set That's Graphed on a Number Line? If you have ever stared at a number line with dots on it and wondered 'How could I summarize these dots? ', then this is the tutorial for you! How Do You Graph an Inequality or an Infinite Set on a Number Line? Number lines are really useful in visualizing an inequality or a set. In this tutorial, you'll see how to graph both. Take a look!